Etrade FREE Trade - Etrade offers up to $600 plus 60 Days of FREE Trading! Here is a great offer from Etrade which is giving new etrade brokerage account holders 60 Days of FREE Trading (up to 500 commission FREE trades) plus up to $600 depending upon your initial deposit amount. This offer is valid for one new E*TRADE Securities Individual, Joint or Retirement account opened by 12/31/2013 and funded within 60 days of account opening with at least $10,000. Requirements to earn Etrade's 500 commission FREE trades? Commission free trade offer applies to a new E*TRADE Securities Individual, Joint or Retirement account opened with $10,000 minimum deposit. New accounts must be funded within 60 days of account open to remain active. » $25,000-$99,999 will receive $200. Your account will be credited within one week of the close of the 45-day window. Accounts must be opened by December 31, 2013, the offer expiration date. When will I get Etrade's free trades? How will I earn Etrade's free trades? You will pay $9.99 for your first 149 stock or options trades and $7.99 thereafter up to 500 stock or options trades (plus 75¢ per options contract). Your account will be credited for trades within a week. Account must be funded within 60 days of account open. You will not receive cash compensation for any unused free trade commissions. » This offer excludes current E*TRADE Financial Corporation associates, and non-U.S. residents. » It's not valid for Unincorporated Organization or E*TRADE Bank accounts. » New funds or securities must remain in the account (minus any trading losses) for a minimum of six months or the credit may be surrendered. » One promotion per customer. » E*TRADE Securities reserves the right to terminate this offer at any time. » Consult your tax professional regarding limits on depositing and rolling over qualified assets. Wow! 500 free trades from Etrade! This is an amazing offer. It's a boon for active traders :). You are right :), this is a great offer for active traders! 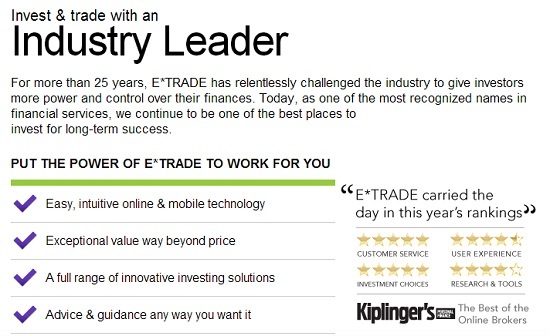 Plus Etrade offers some of the finest trading tools to their Power Etrade customers. Amazing offer, Thanks for thinking in the traders finances. this brings a bunch of new opportunities.